Amy Simon’s been kind enough to share her May journal entries with us – the travel! the shows! Mama Expo! and more! Want to find out more about her work? 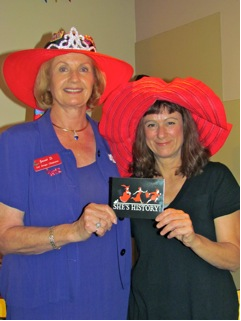 Visit ShesHistory.com and watch for part two next Sunday! My Sunday morning audience: Eighty beautifully dressed, red-hatted, well-fed, fifty years and older lovely ladies of The Red Hat Society. I booked this gig at Sze Chwan – a Chinese Restaurant in the Los Angeles suburb of Canoga Park before I was asked to perform two shows two days later in New York City – my hometown – at the Mama Expo on May 24th. So. Sunday morning, I load up the car, journey to “the valley,” pull up, unload, am surrounded by a sea of red hats, set up, wait for lunch to be over, do the show (which went really well), strike the set which includes the slide projector, speakers, costumes, props, et cetera, get paid, load up and jump in the car – grab a sandwich and head home. Unpack, re-pack for the New York shows and get it together. Wake up at 4:00AM – get to the airport at 6AM – for a 7:20AM flight – on which I get stuck in the middle seat. Torture. But. I am bringing my show to New York. Wow. Schlep, schlep, schlep, the projector, speakers, laptop and few personal items that filled to the max the one carry-on bag and one personal item allowed (could not, would not, did not risk checking my bags). The plan is to arrive at 4:00PM – go straight to the theater for tech rehearsal. I am sharing the show night and the rehearsal with another play that follows mine, and we’re both on another show’s set. For the uninformed, tech rehearsals are traditionally hell and this one did not disappoint. Months of planning, negotiating and scheduling had gone into this one tech rehearsal. I had shipped my suitcase of props and costumes ahead to my friend Tom who kindly agreed to meet me at the theater with my show in a suitcase. After my $55 cab ride from JFK, I checked in to the Excelsior hotel on West 81st Street (one street down from the apartment I had lived in for 10 years as a struggling actress!) and immediately lugged my suitcase to the Drilling Company Theater on West 78th. Two long, long flights up I enter the really sweet “intimate” theater. It is perfect. There’s Tom! Yay! There’s my suitcase with the cables and adapters and costumes and props. I begin setting up and spend an inordinate amount of time figuring out where the screen goes which determines where everything else on the stage goes – including me! The blessing and curse of running my own show is I am technologically empowered, do not have to train – or pay – anyone – to run the show, which includes about 100 slides. There are lots of transitions, cues and music, which I run with my remote from the stage – it is truly a one-woman show. After a very arduous and typically trying tech, we get the screen set up – the stage set up – am finally happy and immediately strike, pack up and schlep the TWO suitcases down the two flights of stairs and back to the hotel. I am wiped out. Dead. And starving. I need a glass of wine and some carbs. The concierge suggests an Italian restaurant and after walking around trying to find a less swanky one, I go in and order my wine and pasta and – I am a new woman! Back to the hotel – call home and get the girls on the phone. They are three hours behind. I was concerned because my 18-year-old, Rose, was working at Banana Republic and I hated my 14-year-old Ruby eating and being alone on a school night. I have never left my girls alone for this long before and although I knew my “village” was right there – I still felt guilty. Ahh, the curse of the working mother. But turns out Rose’s shift was changed and they were together. I am so relieved. I re-organize all the suitcases for tomorrow’s double-header – the first show is at 11AM at the conference. What is MamaExpo? MAMA Expo & M.O.M. Conference: Modern Ambassador for Maternal Advancement. Raising Awareness the Museum Of Motherhood (M.O.M.) and Women, (M)others and Families Everywhere. Empowered by Mamapalooza & hosted by Marymount Manhattan University, New York Parks Dept. The conference is organized by a magnificent magnet of all things mothers and marvelous – Joy Rose, the founder of Mamapalooza and The Museum of Motherhood. “Just get here, I’ll do the rest.” Joy told me back in January, when she asked me to bring SHE’S HISTORY! to the conference. So there I was – a “presenter” at the three day Conference – right smack in the middle of all these really fascinating and accomplished and cool cool cool women. AND she got me an evening show the same night. I got TWO slots at the conference.